I just bought a new mint green from Barry M and couldn't wait to try it out. Emma is a huge fan of mint and I'm very jealous of her collection! 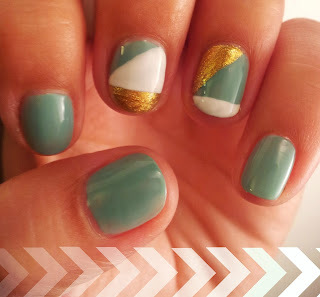 For these I decided to team the mint base with gold and white detailing on two accent nails. I achieved the straight lines using a striper brush so I didn't have to faff around with tape. You could use tape for a cleaner line, but make sure the base is fully dry first! I wasn't sure how this design would turn out but I like the slight 1930's art deco vibe. Will definitely be using this trio of colours together again!